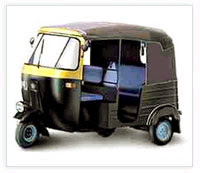 I am crazy to get an auto rickshaw. I think they are way cool and perfect for tooling around this small town and for jaunts into the countryside. What do you think? Then, to take it further, the indians have auto rickshaw races>>. Dinesh Kini has written a nice synopsis of the wonders of the auto rickshaw. Maybe we could attach a snow plow to the front of it? Just kidding. School excused today due to windchill. So "hail, hail, the gang's all here"! Am trying to get all the stuff on my desktop to a level I can leave it with Erich for a week--so, am a bit frantic. A surprise project was literally popped on me at 6 p.m. on Friday with the wrong direction from one person (to find out after 6 hours of work) and then the re-do that took until mid Sunday. I was not totally happy. That's done, so we can move on. Am researching transporation modes, prices etc in London.Feel like I am getting a handle on all of this. The best site is Britain Express that plugs all sorts of deals, and travel opportunities that are not so evident. I have discovered this too late, but for the next time...However, the big "ah ha!" was that most museums do not charge admission. Yay! !